When one has an altarpiece, and wants to flank the central Christ or Virgin with a pair of solid, unobjectionable companions, ones which make no particularly strong statement about one’s patron or native city, one can always fall back on Peter and Paul. Occasional attributes: With/on a boat sometimes, generally old, fluffy white beard, wearing Roman-type robes. Sometimes he’s dressed like a pope or has pope accoutrement, which he has every right to. Patron saint of: Popes, fishermen, shipwrights, other types of workmen like cobblers, carpenters, bakers, masons &c. A working class saint. Peter, of course, one sees everywhere in Rome, since popes never tire of reminding the public who they work for, and there is no better political endorsement. There is an interesting rank split in Peter’s associations, since, on the one hand, as a humble fisherman he’s a the poor tradesman class, someone whom a simple Renaissance laborer might identify with and expect to understand and sympathize with his travails, while on the other hand as founder and patron of the papacy he is the master of popes, who are in turn masters of kings and (depending on whose propaganda you believe) successors to the Caesars. Prince and peasant in one figure makes for a lot of interesting decision-making come portrait time. 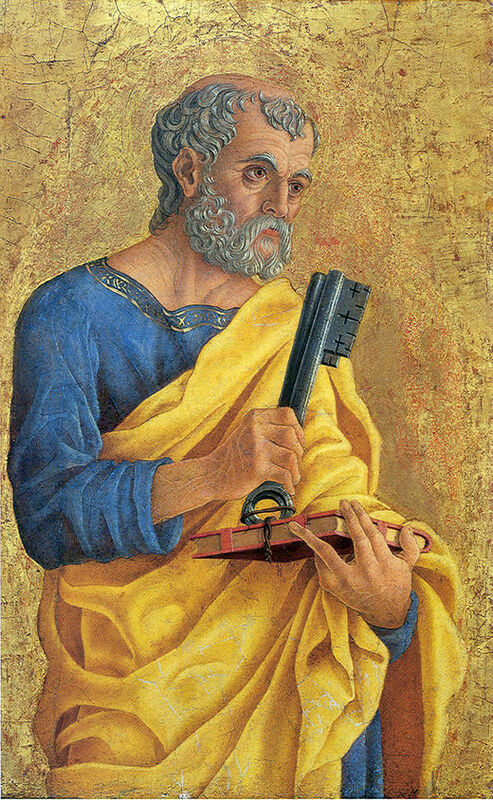 Occasionally one sees Peter dressed as a pope, to accentuate this status, but most often he’s in the usual Apostolic uniform of a loose tunic/robe with a loose toga/wrap around it, usually in two different bright colors and generally not pink (that’s for John the Evangelist). The keys to Heaven make Peter one of the easiest saints to recognize. Often if they are depicted as one gold, one silver, the silver leaf sometimes used on the silver one will tarnish over time and turn black, which can be visually confusing. Peter’s keys by themselves are the symbol of the papacy, and if combined with a papal triple tiara and put over a coat of arms indicate the arms of a pope. Seeing Peter on something should always make one wonder whether it was paid for by a pope, or made in Rome, but the man who mans the gates of Heaven is all-important enough that everyone everywhere is inclined to invoke, and depict, him as often as possible. Remembering that Paul was a Roman citizen and originally charged with persecuting Christians before his vision, blindness, cure and conversion, a few artists like to depict him in his younger days. 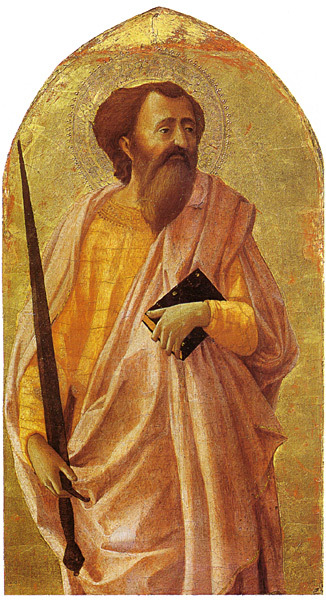 His beheading is reported only in incomplete and unclear documents, but he carries the headsman’s sword, which must always be two-edged because, as it’s told, the sword which struck Paul made him an even more powerful agent of Christianity, thus metaphorically cutting back at its wielders. The vast majority of images of St. Paul that I find here in Florence show him standing symmetrically opposite, or sometimes next to, Peter, as the two major and universally-respected Roman saints. Often Paul’s beard is longer, and sometimes more on the gray side, compared to Peter’s. 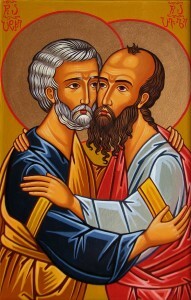 Peter and Paul were also good friends, and one sometimes sees the scene of their friendly embrace. When I say Paul is the patron saint of P.R., that’s my best summary of his extensive list. Apart from the usual hailstorms and snake bites that all major saints wind up being associated with, the motif of Paul’s patronage is of publicity. Because he himself was such an ardent and vocal proselytizer, and left so many writings responsible for aiding the spread of early Christianity, he is invoked as patron of people who convert, people who try to convert other people, but also of authors, and publicists, and journalists, and editors, and people who write hospital newsletters, and generally all people who are responsible for informing people of things. Blogs too, I suppose, though G.K. Chesterton has also been nominated. Who do we have here? 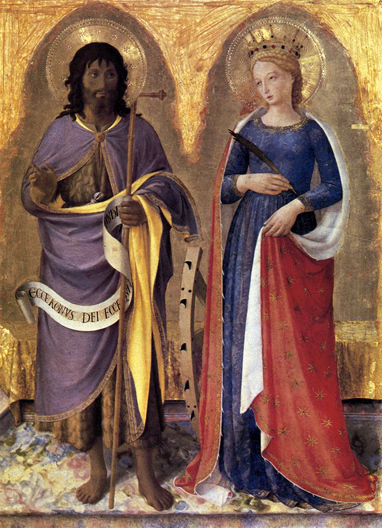 A flanking section from Fra Angelico’s Perugia Polyptych. Can you tell which side of the image Christ is on? Jump to the next Spot the Saint entry. Seeing “Las Vegas” on that list led me to the Wikipedia list of patron saints of places. It’s incomplete both for saints and for places, but it made me cutious about saints whose only places are in the New World. Did Thomas More sit in Heaven with his bliss slightly tarnished before he was adopted by Arlington, Virginia? But that’s nothing to poor Philip the Apostle, who had to wait from Apostolic times until the invention of Uraguay to have a place of his own! I expect he spends a lot of time sighing over it. It also makes me think new places instead of going for a popular saint might get more attention from saints like Illtud, Teilo or Gummarius, who only have one small place to patronize and might be delighted to have another.